Space is the best thing ever. Therefore, the latest Humble Weekly Bundle is the best one ever. 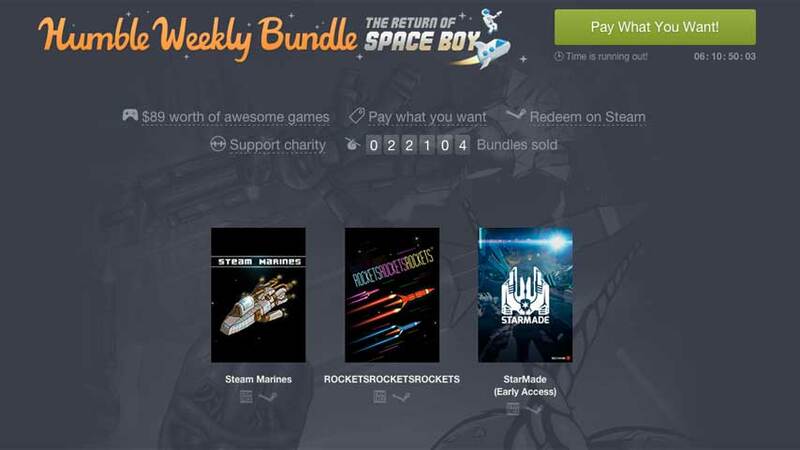 The latest Humble Weekly Bundle is called The Return of Space Boy. Pay what you want for Steam Marines, ROCKETSROCKETSROCKETS and early access to StarMade. Beat the average ($5.31 at time of writing) to also grab Interplanetary, Starwhal and early access to Edge of Space. Pony up $10 or more for Reassembly. There are several Linux and Mac options available, and a couple of DRM-free titles, too. As ever you choose how your funds are split between developers, organisers and charities. This week, proceeds benefit the Challenger Center for Space Science Education and the The Givers Fund, run by Science Fiction & Fantasy Writers of America. You have one week to take advantage.